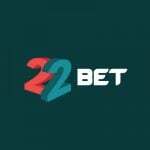 22bet Casino – Claim Up to $/€100 Today! If you’re looking for a seriously fun minimum deposit casino, you’ve got to check out 22bet. Launched just last year, this online casino has been designed by people who are clearly passionate about gaming. You can quickly and effortlessly find everything you need all neatly presented on a modern betting platform. 22bet online casino offers excellent odds for excellent returns. There’s also a wide array of games and registering quick easy, even if you’re new to online gambling. We’ve put 22bet through our rigorous review process to bring you everything you need to know about this nifty online casino. 22bet knows that you want a superior online casino experience right from the start, and it doesn’t fail to disappoint with a generous welcome bonus. This casino offers you a 122% match deposit bonus up to $/€50 and 22 bet points on your first deposit. Make a second deposit and you stand to get a 22% match deposit bonus up to $/€50 and another 22 bet points. To clear the bonus, you need to bet the combined amount of your deposit and bonus 50x. The wagering requirements are the same for both the first and second deposit bonuses. The excitement doesn’t stop there. 22bet offers plenty of bonuses and promotions on an ongoing basis. The bonuses page has everything you need to know about upcoming sports and casino bonuses along with what’s currently on offer. On Fridays, players can avail for the reload bonus, provided you make a deposit on the day. For this one, you could get your hands on up to $/€122 along with 22 bet points. When you take part in the Friday reload bonus, your also qualify for the Reload x2 promo. To get a piece of that pie, you need to make a deposit on a Wednesday and claim the percentage of bonus equal to the cash amount you claimed on the previous Friday, up to the amount of $/€122. What we do need to mention, though, is that the reload bonuses are only for the sportsbook side of 22bet. As far as casino promotions go, keep checking back here regularly for the casino’s latest offerings. 22bet is certainly not stingy when it comes to a list of payment methods. In fact, there are 175 payment methods to choose from when you play at this online casino. From e-wallets and bank cards to cash, mobile payments, e-currency exchanges, payment systems and internet banking and more, you’re spoiled for choice. There are even 19 cryptocurrencies available. Best of all, the minimum deposit amount at this casino is just $/€1. As for withdrawals, you can choose from 89 methods, with most requests processed in a mere 15 minutes and not carrying a service charge. Before you can withdraw your winnings, your account must be verified as part of standard company practice and this takes around 72 hours after you’ve submitted the necessary information. The minimum withdrawal amount at 22bet is $/€20 and there is no maximum withdrawal limit. 22bet online casino offers one of the most impressive selections of slot machine games around. From Wild Magic to Panda Pow, Agent Valkyrie to all the most popular and entertaining slots around, you’re never going to run out of options. If you love the thrills of progressive jackpots, 22bet casino does not disappoint. This casino offers games from major players in the casino software industry, including Quickspin, BGaming, Wazdan, BetSoft, PlayN’Go, Endorphina, Belatra Games, EvoPlay, Amatic Industries, GameArt and plenty others. Some of their best jackpot slots include Double Cash, Progressive Diamond Jackpot, Mr. Vegas, Saharas Dreams, Chili Gold, Serengeti Lions Stellar, Dolphin Gold with Stellar, Mr Toxicus, Fruits of Neon and Neon Blackjack Classic to name a few. The casino also has top-notch themed slots from software giants, NetEnt and Microgaming. Famed for exciting slot games, these developers offer big titles like Planet of the Apes, Starburst, Legend of Shangri-La, Wolf Cub and more. There is also a good collection of video slots, 3D slots and classic slots. If you much prefer to hit up the tables, 22bet online casino is the place to be. After all, a casino’s table game offering can make or break it, and we’re safe to say 22bet excels. Here, you can play all the classic casino table games, including craps, poker, blackjack, roulette and baccarat. There is also Five Hand Vegas Blackjack, American Blackjack, Single Hand Blackjack, Multi-Hand Blackjack V2, Ride’em Poker, Sic Bo, Craps, Draw Hi-Low, Red Dog, 21 Burn Blackjack and so much more! You don’t need to be new to the world of online casino betting to know a thing or two about poker and just how popular it is. At 22bet online casino, you can play poker through the board games tab or you can click the main poker tab where you’ll find a fantastic array of poker slot machines. Just some of the titles you will find at this online casino include Bonus Deuces, All America, Pyramid Deuces Wild, Double Jackpot, Jacks or Better, 10s or Better, 4 of a Kind Bonus Poker, Oasis Poker Classic and Oasis Poker Pro Series. As if hundreds of incredible slots, tons of table games and plenty of poker variants aren’t enough, there’s also a live dealer section at 22bet online casino. We all know that when it comes to looking for an immersive casino experience without leaving home, live casino games are the way to go and at 22bet casino, you can choose from a selection of different live casino providers and have tons of gaming fun with other players from around the globe. What’s more, the live casino games are managed by real live dealers and include the likes of poker, roulette, baccarat, money wheel, blackjack and loads more. What we really love about live dealer games is the fact that you get to interact with real dealers in real-time and 22bet has a team of well-presented, professional and experienced dealers to boot. When you need a break from the casino action, check out the 22bet sportsbook. There’s plenty to bet on, including football. In fact, there are more than 100 football betting lines from matches from around the globe, including France, Australian League, Japan League and all the big, popular leagues, too. There’s also beach volleyball, ice hockey, table tennis, horse racing, basketball, tennis, baseball, Australian Rules, rugby, streetball, durak, lottery, TwentyOne and a good selection of e-sports games such as Rocket League and Counter-Strike. It’s pretty safe to say that no matter what your online betting preferences are, 22bet online casino has you covered. 22bet online casino may be fairly new to the market, but it doesn’t not fail to deliver an excellent mobile experience. This online casino offers a smoothly functioning intuitive mobile version that you can access through your smartphone or tablet’s web browser. The casino page effortlessly adapts to your device and offers pretty much all the same features as you get on the desktop casino. It’s perfectly organised to ensure you never compromise on any of the games or functionalities. To access the mobile casino, simply open up your mobile device’s internet browser and enter the casino’s URL. Log in to your player account and enjoy all your favourite games no matter where you are or when you feel like it. You’ll find the entire mobile experience incredibly user-friendly, so there’s not much need for a native app. 22bet Casino is owned and operated by a business called Marikit Holdings Company which is registered in Cyprus. The online casino ins available in 50 languages and its gaming license is issued in Curacao. 22bet online casino is big on security. The platform has gone to impressive lengths to safeguard your banking and personal data with the help of SSL and https protocols. What that means for you is that the casino is completely encrypted and secured using the very best security technology. Games are also audited for fairness and random outcomes. Whether you need help opening a new player account, help with payments or bonuses or simply have a quick question, 22bet’s customer support team can be reached around the clock. You can talk to someone via the live chat function or email. There is a FAQ section, but it takes a little investigative work to find it, and sometimes it’s just easier to ask customer support for a quick hand. They support team are knowledgeable and helpful and if you prefer to write them an email, you can expect an answer in under 24 hours, which we commend! 22bet online casino may seem like it’s geared towards online sports punters, but this is not the case at all. This online casino has tons to offer gamers. The website, at times, can be a bit cumbersome to navigate, so you might need a little patient, or simply reach out to customer support who are truly on the ball. The almost endless selection of payment methods is impressive, and the welcome bonus isn’t too bad, either. But what sets this casino apart is its fantastic collection of slots, progressive jackpots, table, poker and live dealer games. This is a casino that’s gone to lengths to make sure it has something for all kinds of online gamblers, and we’d say it successfully delivers. We really can’t fault this casino. If you’re looking for a jack-of-all-trades type of platform that offers everything from sports to casino games and more, it’s time for you to open your 22bet casino account and check it out for yourself!